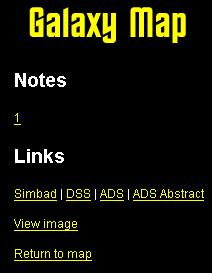 At each zoom level you can navigate on the galaxy map using the arrows at the bottom right. Click on the circle between the arrows to zoom out, and anywhere on the map to zoom in. At the fourth zoom level, you can hover your mouse over any object to see its name, and in the case of a star, its spectral classification. Click on any object on the fourth zoom level to go to its description page. This shows the name, distance, galactic longitude and galactic latitude for each object on the upper left. There is also a link to the source for this information in the scientific literature. Sometimes there is also a text description for this object. We'll be adding many more descriptions in the future. On the right side there is a set of links. Notes go to an individual piece of information about this object with a link to the source of this information in the scientific literature. There can be several notes for each object. There are also a number of general links into the scientific literature for this object. The Simbad link goes to the Simbad database entry for this object. The DSS link displays a monochrome image of the visual night sky in the vicinity of this object (within 15 arc minutes). The ADS link displays a list of scientific papers that mention this object. The ADS Abstract link displays a list of scientific papers that mention this object in their abstracts. The ADS Abstract link makes it easier to find articles with a lot of information about a given object but may miss references that the ADS link returns. 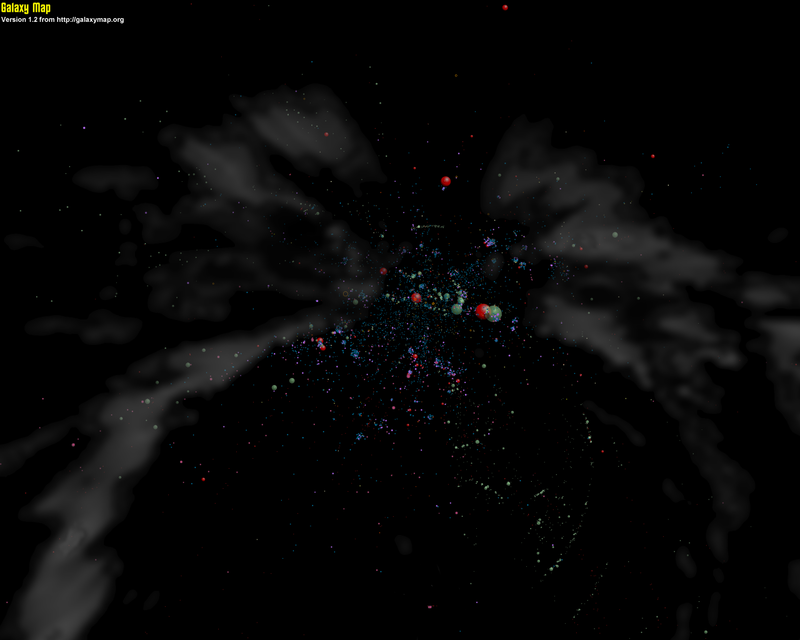 For a star cluster, there is a further link to the WEBDA star cluster database entry for that cluster. This returns information about the age and chemical composition of the cluster and may even allow you to drill down and get information about many of the individual stars in the cluster. In a few cases, there is a colour image for this object, created using the method described here. If an image is available, there will be a "View image" link. From the image page you will be able to return to the description or map page for this object, or go to the gallery page, which enables you to view all the object images currently available. In addition to the main galaxy map, there is also a 1280x1024 overview map that shows the brightest and largest objects in one image, and a 1280x1024 fantasy map that is more speculative as the name suggests, and makes it easier to identify apparent larger Milky Way structures by portraying them in more familiar planetary terms such as gulfs, bays, straits and islands.